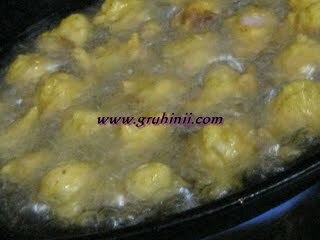 Mix all the pakodi ingredients (except oil) in a bowl. Add sufficient water and make a smooth but thick batter. Heat oil for deep fry in a pan. Drop the batter with the help of a spoon (or use your fingers) in the oil. 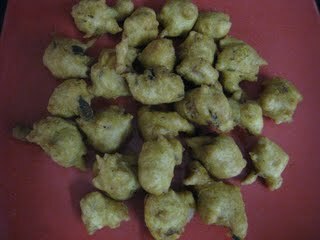 Fry the pakoras until they turn to golden color. Remove from the oil and place them on an absorbent paper. Keep them aside. Take another pan, heat a table spoon of oil. Add jeera to it. 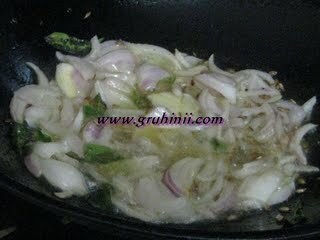 When it starts spluttering add the onions, green chillies and curry leaves. Fry until the onions become translucent. Add the ginger garlic paste and stir fry. Now add red chilli powder, dhaniya powder and haldi. 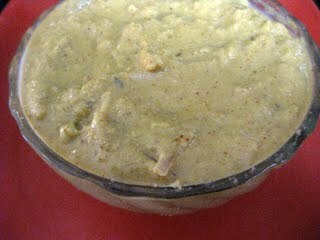 Stir well and add the chopped brinjal pieces. 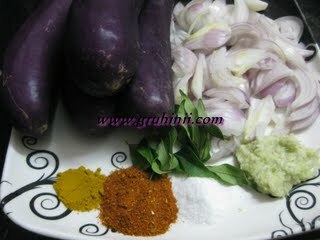 Mix well, close the lid and cook in a medium flame until the brinjal is properly cooked.